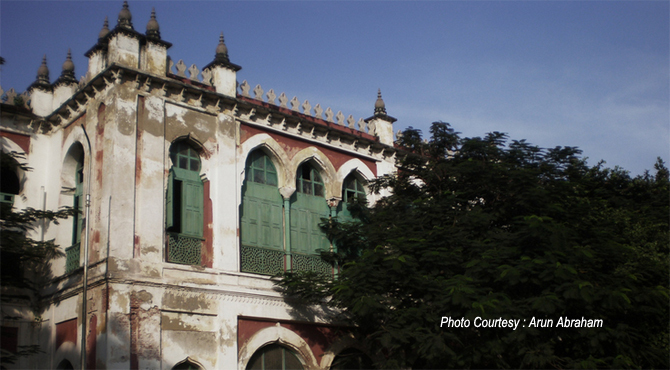 Significance : It was the Madras residence of the Nawabs of Arcot. Chepauk Palace on Wallajah Road near the Marina was the Madras residence of the Nawabs of Arcot , once the rulers of Tamil Nadu. It now houses used by the Board of Revenue and the Public Works Department of the State Government. Now known as the Revenue Board Building it is considered as one of the city's earlier Mughal style buildings. Sadly, the building is now hidden from the road by the Modern PWD building Ezhilagam. Designed by the English engineer Paul Benfield in 1768 it consists of two blocks spread over 117 acres, stretching from the River Cooum to Pycroft's Road and from Bell's Road to the beach. Built in the Indo Saracenic style, it can be visible from the beachfront. It was acquired by the Madras Government in 1885 and it remained empty for a many years before becoming a site for government offices. In 1865, as a symbol of British invasion, Robert Fellowes Chisholm an architect added a tower to link the two blocks Humayun and Khalsa Mahals. It has broad arched entrances at the base, balconies in the middle of each side, slender buttresses at the corners, a small dome etc. The Chepauk complex was surrounded by a wall with broad triple-arched entrances on Wallajah Road and music being played every evening from its top storey. It contains several rows of large brick columns. The two main buildings were the single-storey block comprising the Humayun Mahal and the Diwani Khana Durbar Hall, and the two-storyed block comprising the Humayun Mahal and the Diwani Khana Durbar Hall, and the two-storyed Khalsa Mahal. Near to the Palace is the Presidency College, a 16th century building with Italian renaissance style surmounted by a central dome with clocks on four faces. Rebuilt by Robert Fellowes Chisholm, it is his first commission in Madras. Opposite to this is a public swimming pool with all modern amenities. Further south, is the University Examination Hall, the Lady Willingdon Training College and the Queen Mary's College for women and the office of the Inspector-General of Police.